Planning a trip to Bali? Here are some tips on what to do and where to go when visiting the beautiful island in Indonesia. Hello there! You may have noticed that I was off the radar the end of June and beginning of July. Well, that was because I traveled halfway across the world to Bali! Yep, the island in southeast Asia where Julia Roberts finishes her journey in Eat, Pray, Love. Although, my reason for the trip is less of a self journey and more of a celebration of my cousin’s wedding! Ubud is located in the center of Bali and is known for its stunning temples, traditional crafts and luscious rainforest. 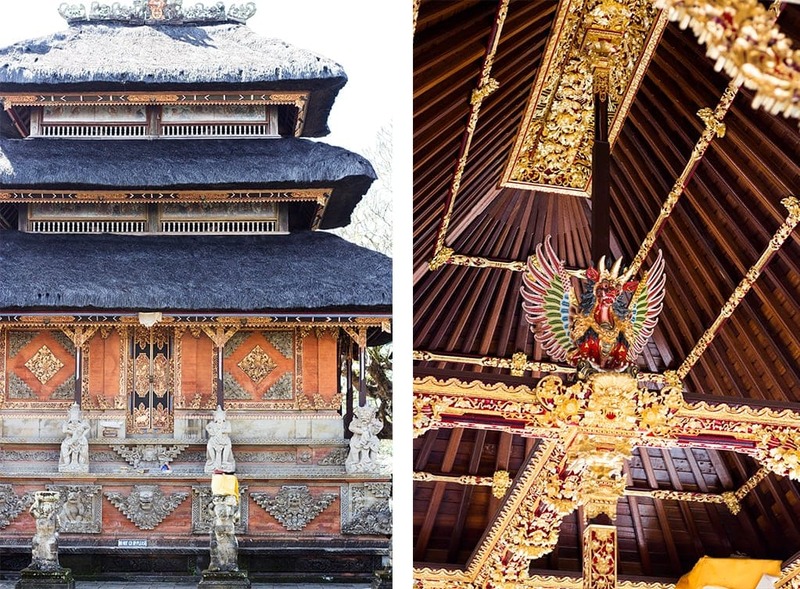 Temples are abundant in Ubud and each are as stunning as the next. Our first day we hit the ground running and saw the oldest temple in Bali, the Batuan temple. It is adorned with ornate stone carvings nearly 1000 years old. The inner courtyard has thatched roof shrines and pavilions with ceilings heavily engraved and gold gilded. I highly recommend getting a tour guide for the day. Our guide, Bayu, was knowledgable, fun and spoke excellent English. My sister now follows him on Instagram. It didn’t take long for me to find food markets in Ubud. The spice stands were the most impressive with the extensive selection for incredibly reasonable prices. I picked up some vanilla bean, whole nutmeg and saffron to take back to the states. 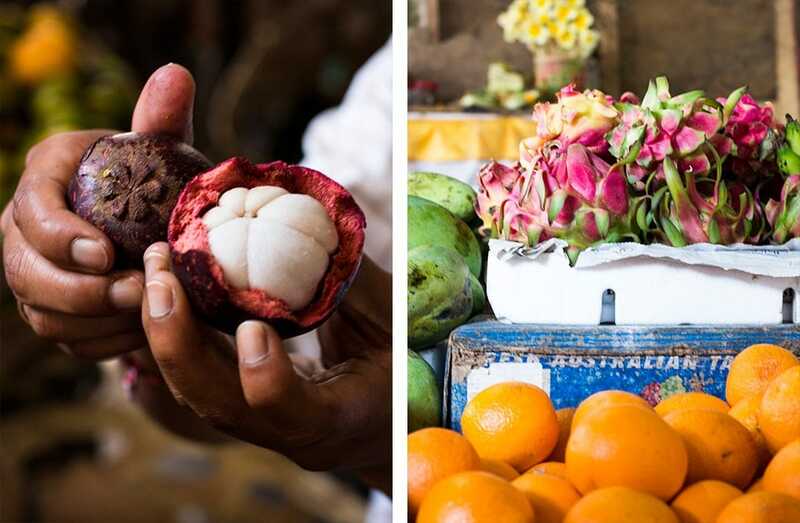 While there is plenty of fresh produce, it’s best to stick to fruits with thick skins such as mangosteen (left) and dragonfruit (right). No Bali belly here! The food market tour was actually part of the cooking class I took in Ubud. If you are ever in Bali and are a foodie I highly recommend this class (it has five stars on trip advisor for a reason). The matriarch, Puspa, has been hosting the class for some odd years and she has it down to a science. A group of us were taught how each dish was prepared and assigned a job to make the meal come together seamlessly. 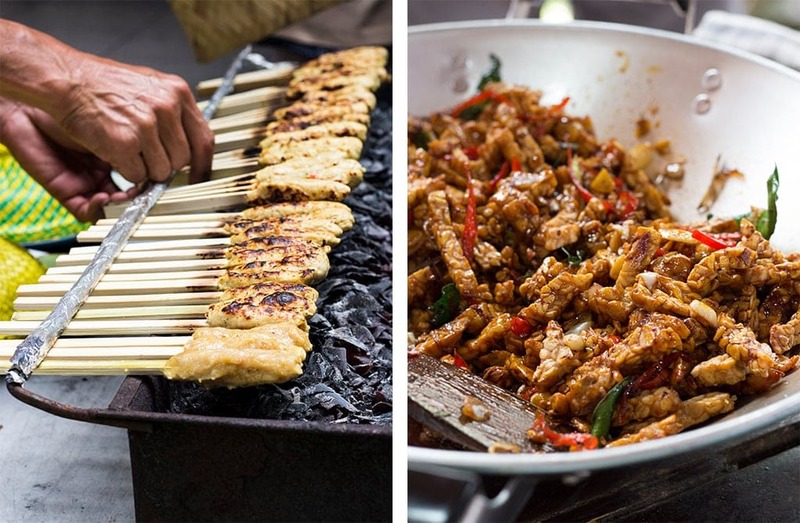 From chicken satay to tempeh, I learned a lot about Indonesian cuisine and enjoyed making our meal as much as I did eating it! You can learn more about the cooking class here. I had the pleasure of seeing a Balinese performance while having dinner at Cafe Lotus. This restaurant is located right next to a scenic lotus pond that leads to Saraswati Temple, which was the stage for the show. 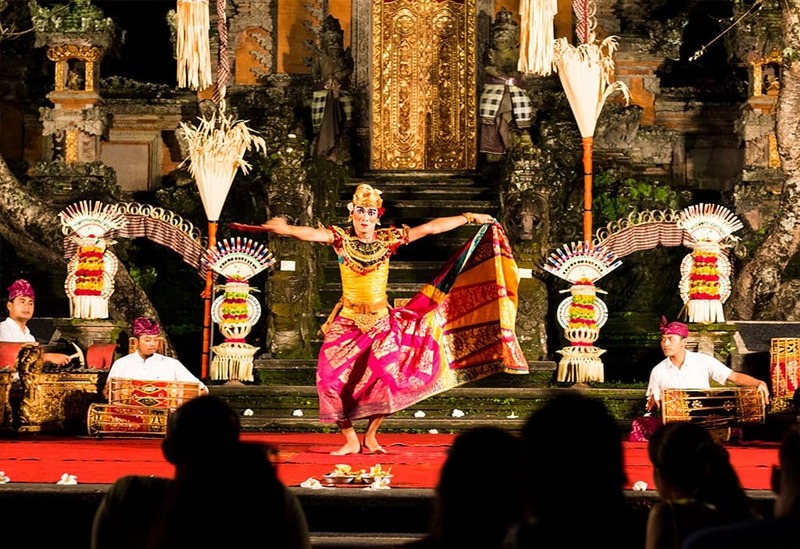 With a orchestra of musicians and talented Indonesian dancers, this show was a nice dose of culture in Ubud! 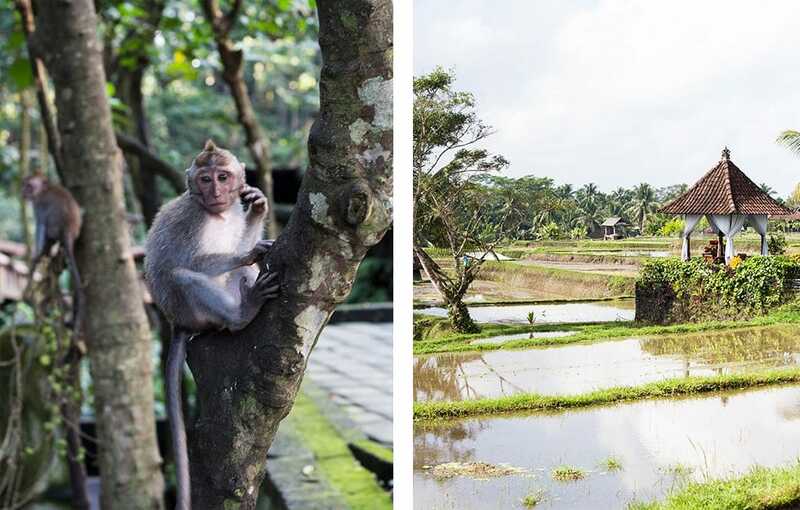 A popular stop in Ubud is the monkey forest. This area on the edge of the city is home to hundreds of monkeys who are very friendly with the tourists (read: they may take sunglasses of your head). If you take a ride along the outskirts of the city, the roads are lined with rice paddies. When we arrived in late June the paddies had recently been harvested, but they still looked remarkable with the terraces leading up to the rainforest in the distance. The most impressive view I saw was at the top of Mount Batur. At 5,000 feet, this dormant volcano is one of the highest points on the island and offers a spectacular view of the sunrise. My dad, sister and I hired a guide to show us up the mountain at 4 am to catch the sunrise at 6 am. Was it worth the 2 am wake up call and 3,500 foot hike? Absolutely. Amed is located on the northeastern shore of Bali and is a fishing village. The beaches are lined with traditional outrigger fishing boats and, if you stay closer to Mount Agung, the shore is trimmed with black volcanic sand. Bali is known to have some of the most stunning dives in the world so we booked a dive at Adventure Divers Bali (Marnus is an excellent instructor if you’re a newbie). Right off the coast of Amed is the USS Liberty shipwreck, which is now home to marine life. My parents, sister and I saw barracuda, a moray eel (above), sting ray and half the cast of Finding Nemo. If R&R is more your cup of tea, Aqua Terrace has some of the best massages in Amed with a view to match. The neighboring restaurant Blue Moon Villa has live music some nights along with delicious food and drinks (tip: try the frozen mojito). Gili Trawangan (or Gili T) is known for its thriving nightlife. The island’s main strip runs along the beach and it’s lined with bars open late into the night. If you’re there during the day time, considering renting a bike or hopping on a horse and carriage for a scenic trip around the circumference of the island, which takes about two hours to walk. 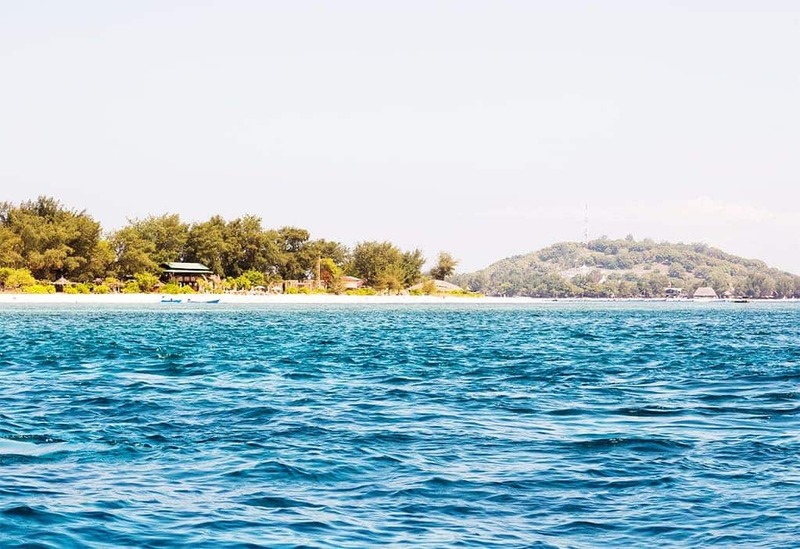 This is the perfect opportunity for island hopping! All the islands are outlined with white sand beaches and crystal clear water. Go snorkeling off the boat if you want to see the sea turtles or make your way on to one of the islands for a cocktail and a bite to eat! Gili Meno (also known as the honeymoon island) is a romantic getaway. My cousin’s wedding was the whole reason for my trip to Bali after all! Shout out to my girl Logan for planning the ultimate destination wedding. 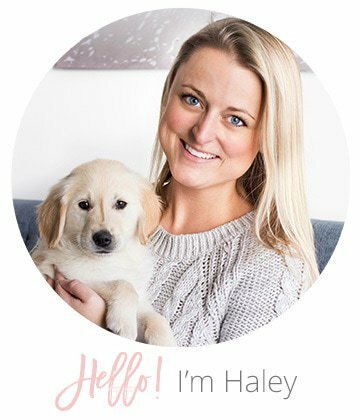 Not only did she plan her big day, but a slew of happy hours, sunset dinners, scuba dives and boat rides for her guests. Yes, that is my cousin, the bride, sitting on an inflatable unicorn. It is also one of the few photos where she doesn’t have a Bintang in her hand. 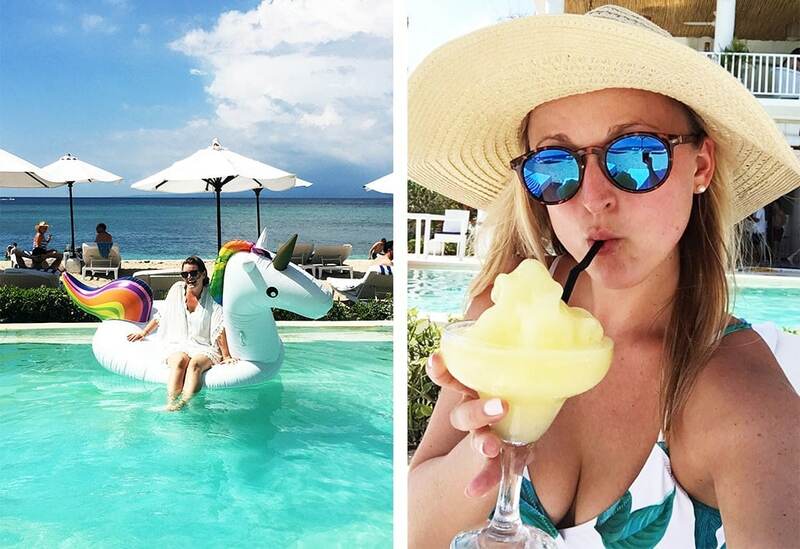 Trips to Bali are meant for fun (destination wedding or not). Sit back, relax and soak up the sun with a drink in your hand. I agree. Fantastic! I’m going to share it with some friends! Thanks, Beth! So happy you enjoy the post. Trip of a lifetime! Super post, daughter! Now I want to go back!! What a lovely trip and beautiful place for a wedding! Bali is on my must-visit list and your post gave me a few ideas.